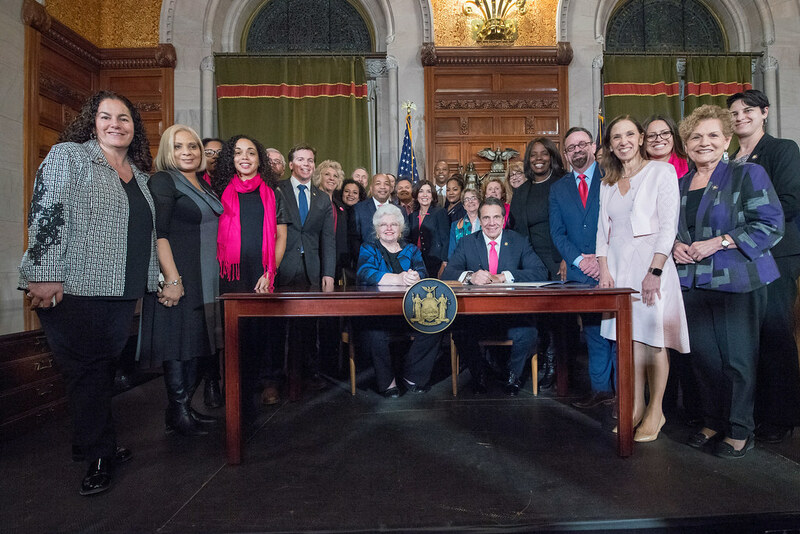 Governor Andrew M. Cuomo today fulfilled his promise to sign into law the Reproductive Health Act, a key component of the 2019 Justice Agenda, within the first 30 days of the new legislative session. The Reproductive Health Act protects women's reproductive rights by ensuring New Yorkers can make personal healthcare decisions and medical professionals can provide crucial services without fear of criminal penalty. The legislation codifies Roe v. Wade into New York State law. "In the face of a federal government intent on rolling back Roe v. Wade and women's reproductive rights, I promised that we would pass this critical legislation within the first 30 days of the new session - and we got it done," Governor Cuomo said. "Today we are taking a giant step forward in the hard-fought battle to ensure a woman's right to make her own decisions about her own personal health, including the ability to access an abortion. With the signing of this bill, we are sending a clear message that whatever happens in Washington, women in New York will always have the fundamental right to control their own body." "As keepers of the torch for women's rights that was first ignited in New York State back in 1848, we have a moral responsibility to continue this fight today," said Lieutenant Governor Kathy Hochul. "Thanks to an election that saw record numbers of women elected to office, I presided over the State Senate and we finally enacted the Reproductive Health Act to protect the rights of women across our great state. We act today on the anniversary of the groundbreaking decision of Roe v. Wade and recognize the threat we face from a Supreme Court determined to overturn protections that have been in place for over four decades. Today is an historic day for women in New York, and I'm proud that we are working every day to ensure full equality and safety for women." The Reproductive Health Act amends the public health law, de-criminalizing women's access to abortions and protecting the doctors who perform them. In the face of Washington's assault on women's rights, including access to all health care options and guaranteed coverage of emergency contraception and other contraceptive drugs, the Governor has taken action to counter the federal government's reversals. In July 2018 the Governor signed an Executive Order directing the Department of Financial Services and Department of Health to administer regulations to insurance providers requiring them to cover over the counter emergency contraception, all other contraceptive drugs, devices or other products for women, and to provide 12 months of contraceptive at one time, all without co-insurance, co-pays or deductibles. "Today we are taking a giant step forward in the hard-fought battle to ensure a woman's right to make her own decisions about her own personal health, including the ability to access an abortion." Senate Majority Leader Andrea Stewart-Cousins said, "New York once led the way on choice and women's rights. Unfortunately for years, barriers to women's rights were put up, and our state has fallen behind. Today, we are tearing those barriers down and we are now leading the way again. I commend Governor Cuomo, my colleague Speaker Heastie, and both bill sponsors Senator Liz Krueger and Assemblywoman Deborah Glick for taking historic action and leading New York State forward in the fight for women's rights. It is time for New York to again serve as a progressive beacon to the nation." Senator Liz Krueger said, "The decision about whether to have an abortion is deeply personal. It involves a complex weighing of a woman's unique circumstances, her medical needs, her private morality, and her own body. That is why it is a decision that must be made by a woman and her healthcare provider alone - not by the government. Our abortion laws, once groundbreaking, are now almost fifty years old. They do not meet the standard set by Roe v Wade, and they do not reflect modern medical practice. We will never know how many New York women have suffered and even died because our outdated laws prevented them from getting the care they desperately needed. Today we turn the page. By enacting the RHA, New York will once again lead the nation on women's reproductive healthcare, and help ensure that all New Yorkers have the freedom and opportunity to make their own decisions about their health and their families." Assembly Speaker Carl Heastie said, "While the administration in Washington continues its assault on women's reproductive rights, the Assembly Majority remains dedicated to fighting for a woman's right to choose. The bills we passed today ensure New Yorkers can control their family planning decisions, have access to the reproductive healthcare they need and will not be discriminated against for their choices. With our new partners in the Senate we have finally seen this legislation pass both houses and signed into law on the anniversary of the historic Roe v. Wade decision." Assemblymember Deborah J. Glick said, "New York women deserve to have their own healthcare decisions respected. Women, in consultation with healthcare professionals, and not legislators, should make decisions that affect their own health free of interference. After years of fighting for the passage of this essential protection for women, our moment has finally arrived. The New York State Assembly has kept the torch lit for years, and we are extremely excited to be able to pass the torch to a Senate dedicated to the respect of women and the protection of their basic right to make healthcare decisions. I am grateful for the Governor's support and his eagerness to sign this bill at last." Gloria Steinem said, "A woman's power to decide whether she will give birth or not is the single greatest determinant of whether she is healthy or not, educated or not, works outside the home or not, and how long she will live. This power has been taken away by patriarchy and racism, sometimes disguised as religion, yet it is our most basic democratic right. I'm thankful to Governor Cuomo and the New York State legislature for passing the Reproductive Health Act. It will codify Roe v. Wade in New York State law, guarantee women's right to make decisions about our own bodies, and help create a future in which every child has the right to be born loved and wanted." Andrea Miller, President of the National Institute of Reproductive Health Action Fund, said, "Governor Cuomo has tirelessly advocated for a woman's access to quality reproductive health care, especially in the face of hostile attacks from the president, U.S. Congress and Supreme Court. Today, in signing the RHA, the CCCA, and the Boss Bill, he has cemented New York's role as a progressive stronghold that prioritizes access to abortion care and contraception." Robin Chappelle Golston, President & CEO, Planned Parenthood Empire State Acts, said, "We are here today because we demanded the right to control our own bodies and the ability to access the reproductive health care we require. New Yorkers know that no one should ever have the power to turn back the clock on our health care or take away our rights. Together advocates and our legislative champions worked to secure our reproductive freedom and rights. We thank Assembly Speaker Carl E. Heastie, Senate Majority Leader Andrea Stewart-Cousins leadership and Governor Andrew Cuomo for his vision and commitment to securing our reproductive rights." NYCLU Executive Director Donna Lieberman said, "Today New York State took a historic vote to protect women's rights and autonomy. The Reproductive Health Act recognizes reproductive health care as a fundamental right. It takes abortion out of the criminal code and puts it where women's health belongs -- in the public health law. It recognizes the range of medical professionals that women can turn to, expanding access to early care. Together with the Comprehensive Contraception Coverage Act, this legislation will strengthen a woman's ability to decide what is right for her life, her body, and her family. As attacks on reproductive rights grow around the country, emboldened by the Trump administration's efforts to stack the courts against women, updating New York's abortion law to protect the rights guaranteed by Roe v. Wade is more critical than ever. While there is still more to do to ensure New York can be a safe haven for women all over the country, today is a day for long-overdue celebration."